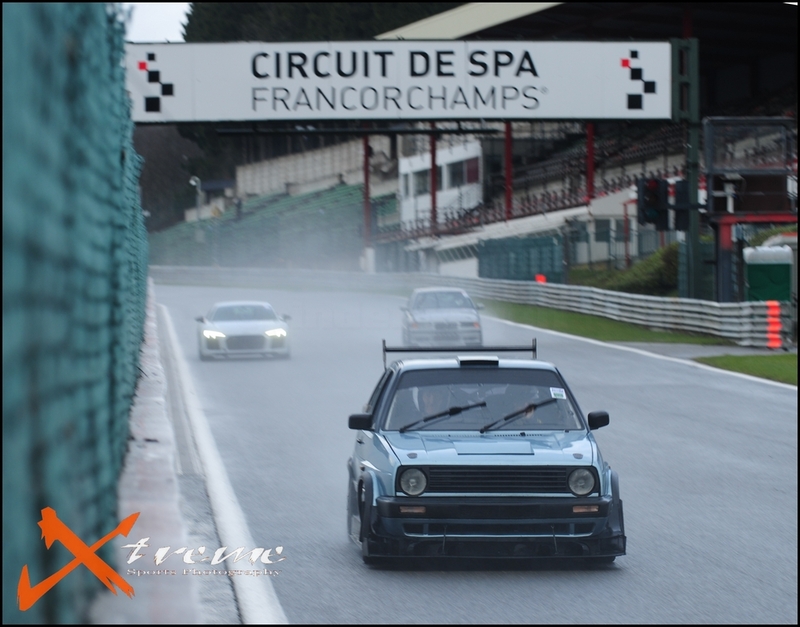 The Javelin dates for Spa couldn’t have been planned any better. 2 days during the Easter holidays when Louise was off work and right in the gap between my night and day shifts . I booked onto both days as soon as they were released. 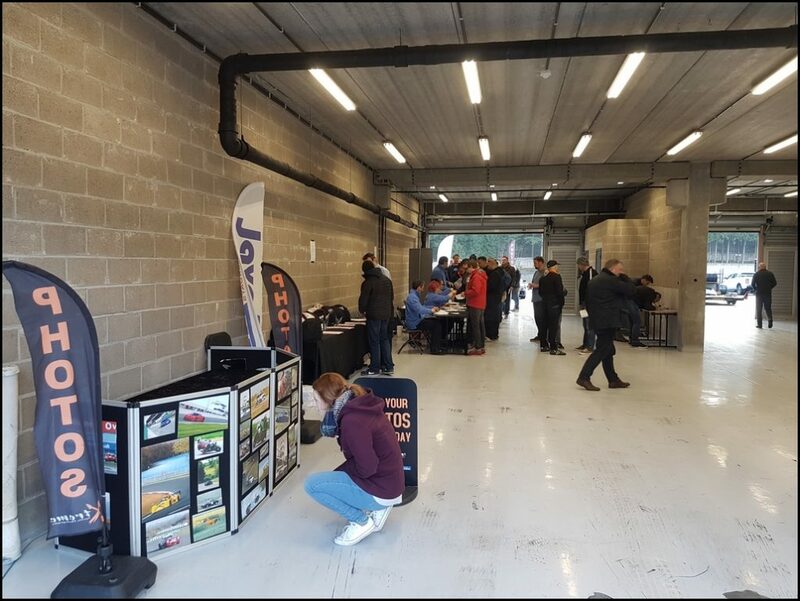 I’m always mindful that these European trackdays are quite expensive but once the actual travel and accommodation costs are factored in, the money spent with the TDO is a much smaller percentage than a normal UK day. That’s not to say that they are cheap events, but the crossing costs the same whether I’m doing one day or two. Croft had been such a trouble free day I was able to finally start doing those little jobs that you keep putting off when something more important demands your attention. I carried out some extensive suspension top mount fabrication to give me even more caster. 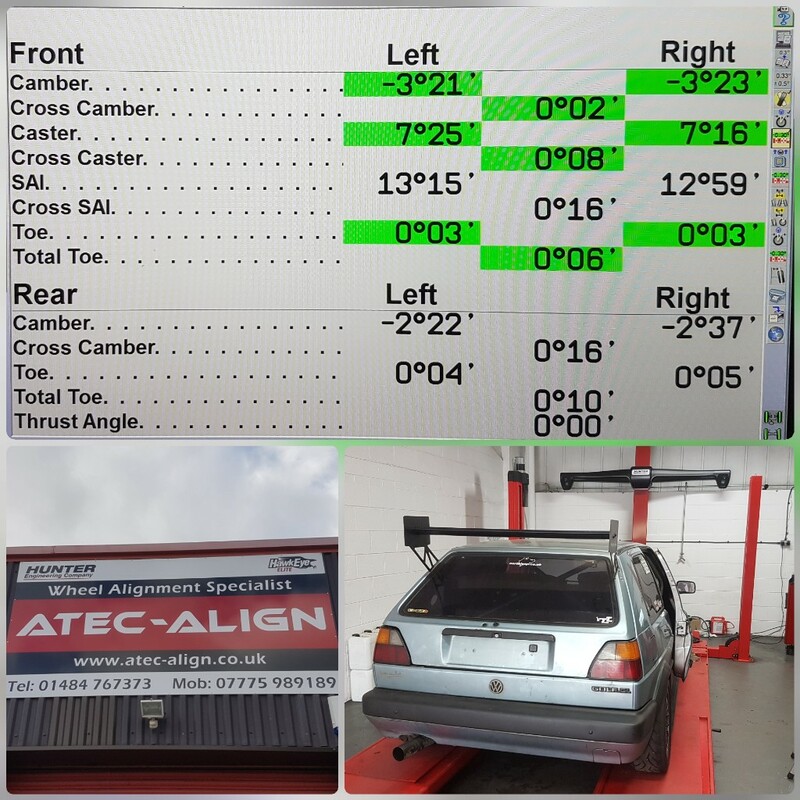 After doing this I took it for a full laser 4 wheel alignment. The car was ready with several days to spare and when we set off to Hull I was full of confidence about the upcoming trip. Matt was going on holiday with his girlfriend the week after and didn’t have enough annual leave to be able to come with us to Spa. Cat asked if she could bring her boyfriend (another Matt) along for the trip. As soon as we drive onto the Ferry and know there is nothing more I can do, I can just relax and enjoy the crossing. 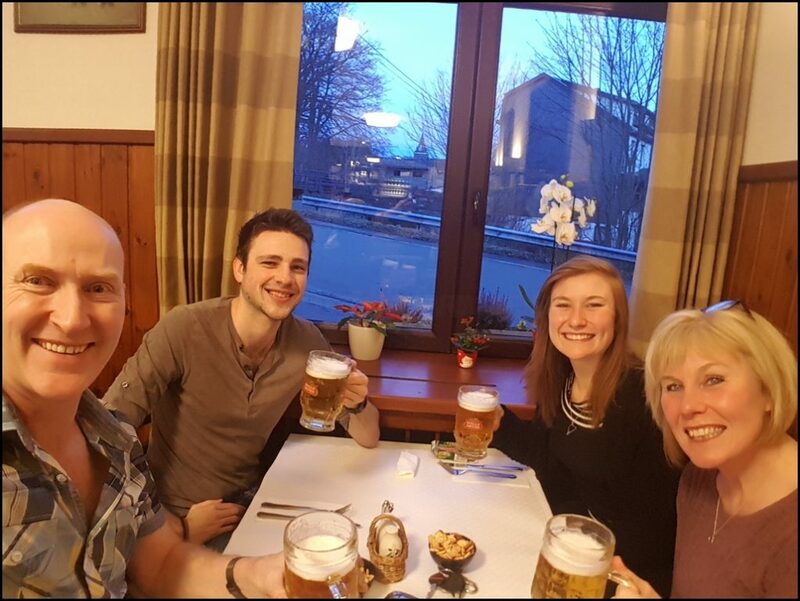 We met up with Anne and Jon for a beer before going for something to eat, then meeting up after for a drink, then calling it a night. It’s a 3 hour drive to Spa and we arrived just after lunch, having stopped along the way for a bite to eat. There were public arrive and drive sessions going on through the afternoon and evening, so we spent some time spectating and having a look around the paddock. We didn’t have anything else planned and it was nice to be able to have a leisurely afternoon watching cars driving round without any pressure of wanting to be out myself. I knew I had 2 full days ahead of me where I should be able to drive as many laps as I wanted. Tristran had been to the Nürburgring with some friends, had called at Spa to do a session and was then setting off on his journey back to Northern Ireland. His fanbelt had failed at the Nürburgring and he’d managed to get hold of a replacement but this wasn’t in the best of condition. He seemed quite pleased when I handed over a spare I’d brought across for him to ensure he managed to get back home. 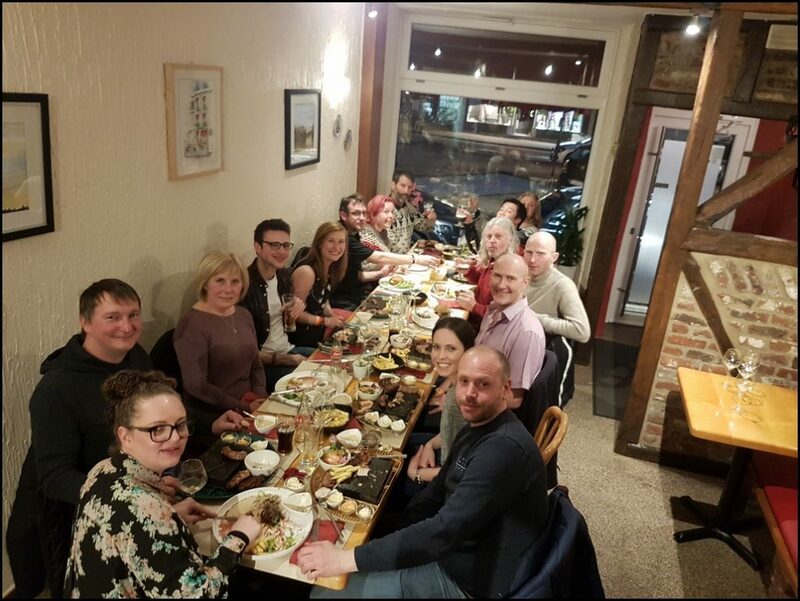 A short drive to the guesthouse we usually stay at, a quick change then out for a meal with Andy and Hayley, along with the people who’d come along to help them run the event. 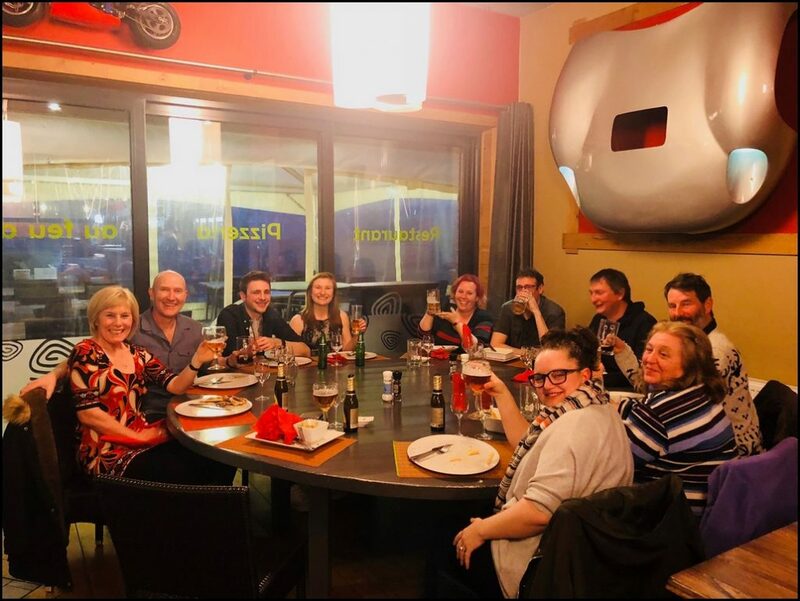 A very enjoyable evening, even though as usual I didn’t have a beer the night before a trackday. We were in bed by 22:30, looking forward to the next morning. After a quick breakfast we drove to the circuit on damp roads under a dark and foreboding sky. 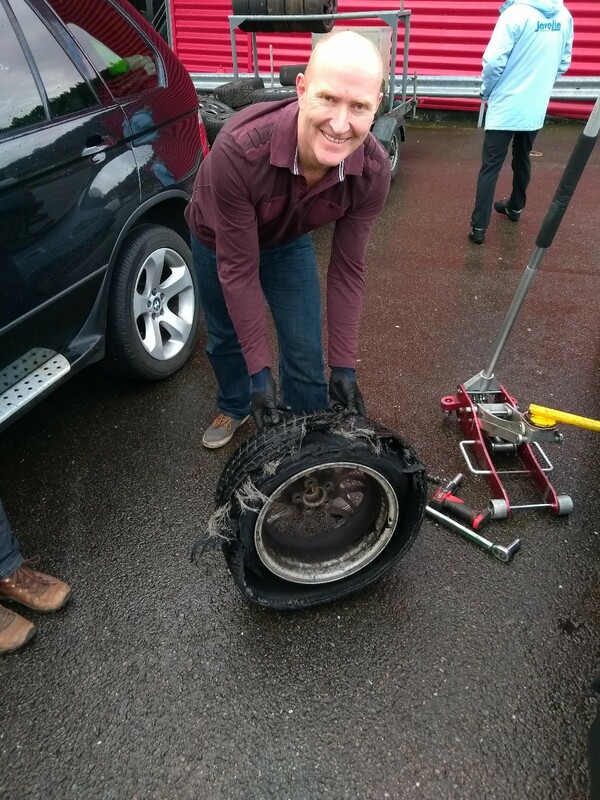 The forecast wasn’t looking too good, but many years ago I realised I can`t affect the weather so I take tyres for every condition and plan to make the most of it. Arrived at the circuit, unloaded the car and started getting ready for the trackday. We were some of the first people there which shouldn`t really come as a surprise. I was looking at the Golf and spotted something was wrong. The sunstrip I’d fitted to the brand new windscreen last week had disappeared. We looked at some photos and worked out it flown off somewhere on the M62. Oops. A few minutes and a roll of black gaffa tape later, a temporary sunstrip was applied. Not ideal but enough to be effective should the sun appear. 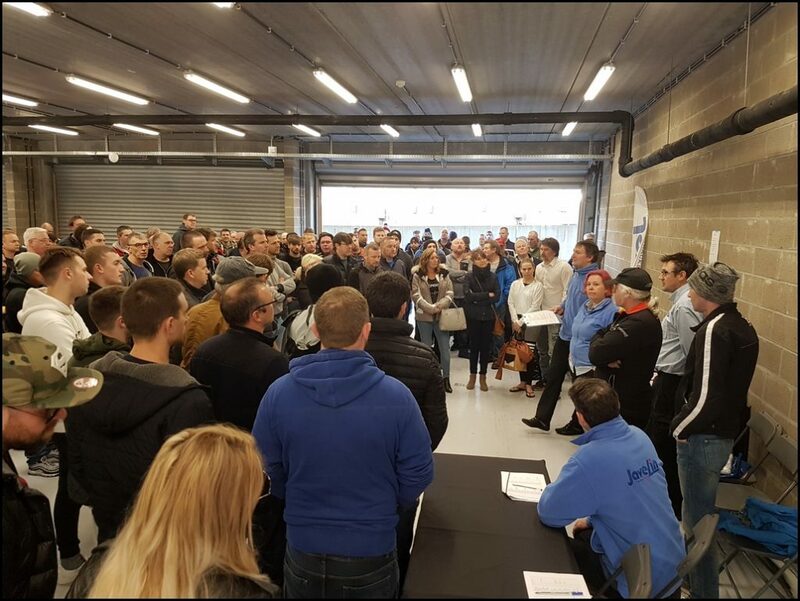 After everyone had signed on, Andy ran through the briefing and reminded everyone this was not a test day, it was a track day and if everyone followed the simple overtaking rules the day would run much smoother. Every briefing explains the overtaking rules quite simply, yet there is always someone who seems to forget what they are told once they get on track and the adrenalin starts flowing. Out for the sighting laps and by now the rain had started falling heavily. Whilst the Direzzas are pretty good in the wet, they are fairly well worn and won’t deal well with any standing water so it made sense to fit the full wets I’d brought along with me. They also warm up quicker in cooler track temperatures, so whilst the first few people were going out on track I quickly swapped wheels. 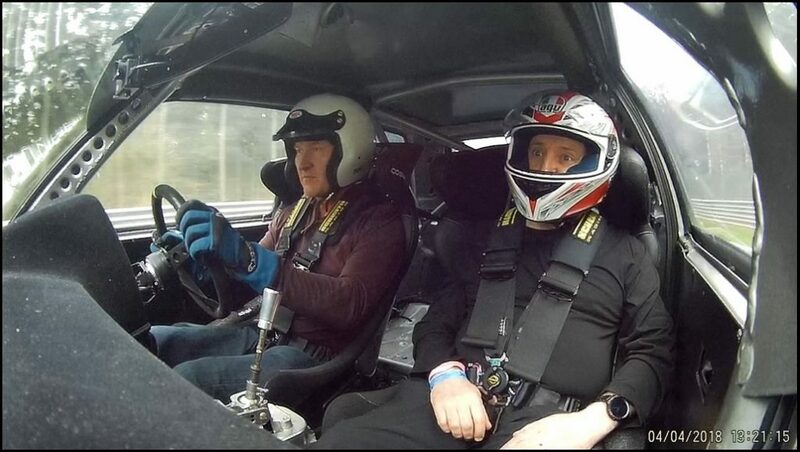 By now everything was fully warmed up, the tyres were up to temperature so Matt strapped himself into the passenger seat ready for his first ever trackday lap. I was able to start pressing on straight from the pit exit. We had discussed it on the way over and Matt said he wanted the “full experience“. 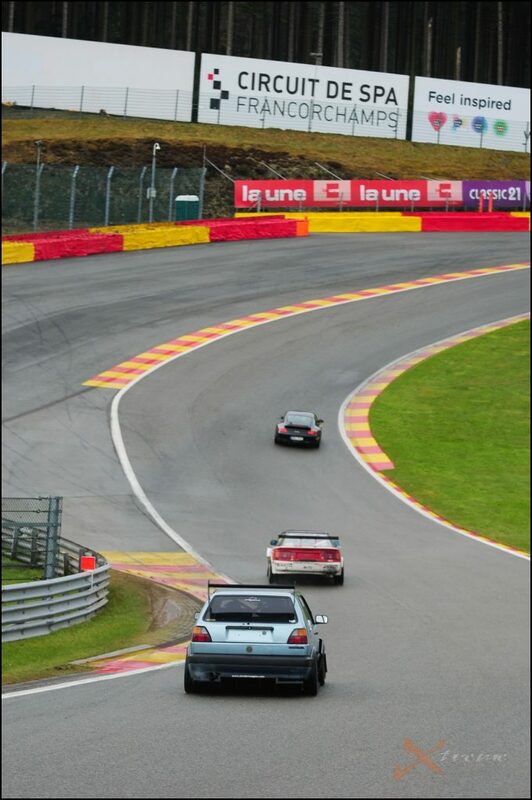 We had agreed I would get the tyres up to temp, then quickly swap passengers and go out with him straight up to full speed through Eau Rouge on Lap 1. On slicks that would certainly have been memorable for him but even in the wet I could see him bracing with the unexpected forces acting on him. 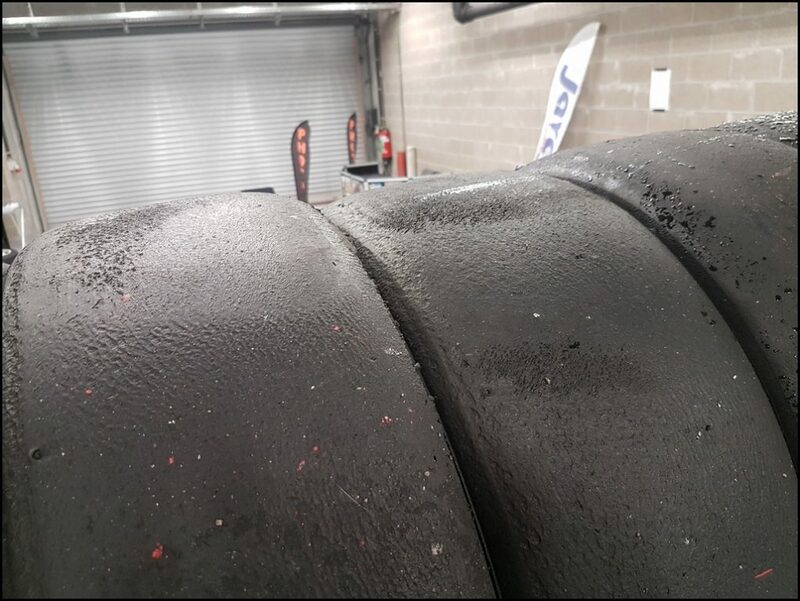 As we were heading up Kemel on the second lap, I felt some vibration from the front right, opened my mouth and said, “I think there is something wrong with this front right tyre…”. No sooner had the words left my lips, had a strip of rubber delaminated and started thudding on the inside of the wing. 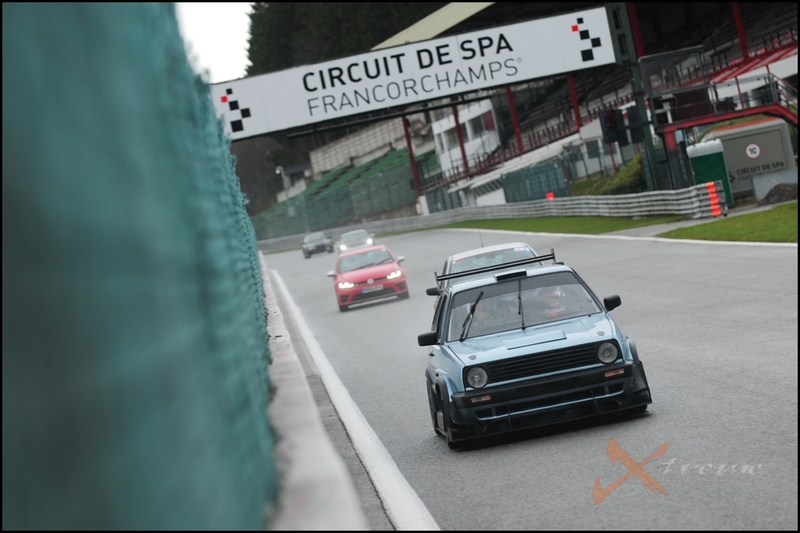 As I’ve mentioned many times, I absolutely hate causing red flags so slowly drove through Les Combes at the top of the hill and pulled off and reversed behind the armco. The marshal asked if I could limp to the next marshal post as that was accessible by the low loader who would be able to recover me without causing a red flag. As the tyre was already useless, I carefully drove along the right hand edge of the circuit whilst the marshals waved white flags behind me signifying a slow vehicle ahead. 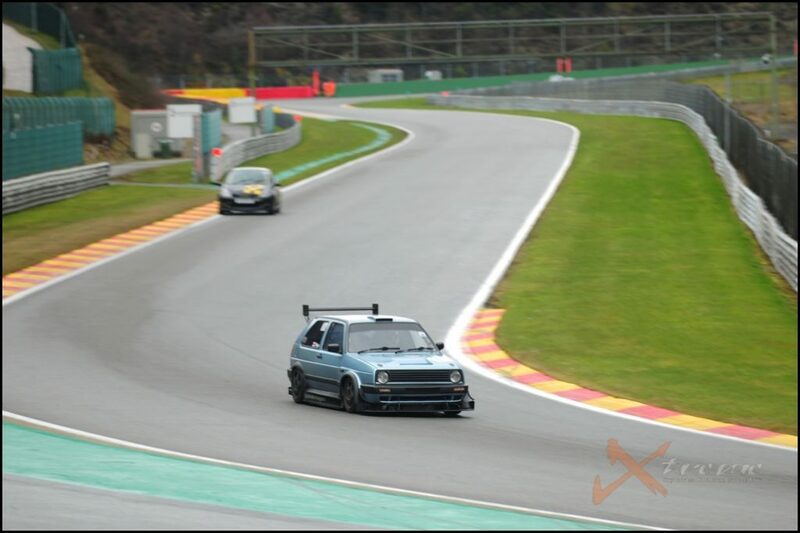 Matt’s first ever track laps were certainly turning out to be quite the experience. We were recovered back to the paddock where I removed all of the wets and fitted my set of R1R’s. These are not quite as good as the full wets but are better than the Direzzas in these conditions. The failed wet and the others fitted to the car showed no signs of damage but I have had them for several years and I believe this was simply a failure of the compound due to age and high speed . I’ve now thrown them all in the bin. Driving to the second marshal post completely destroyed the tyre. It did not fail in this condition, this was a result of my driving on it once it was deflated. 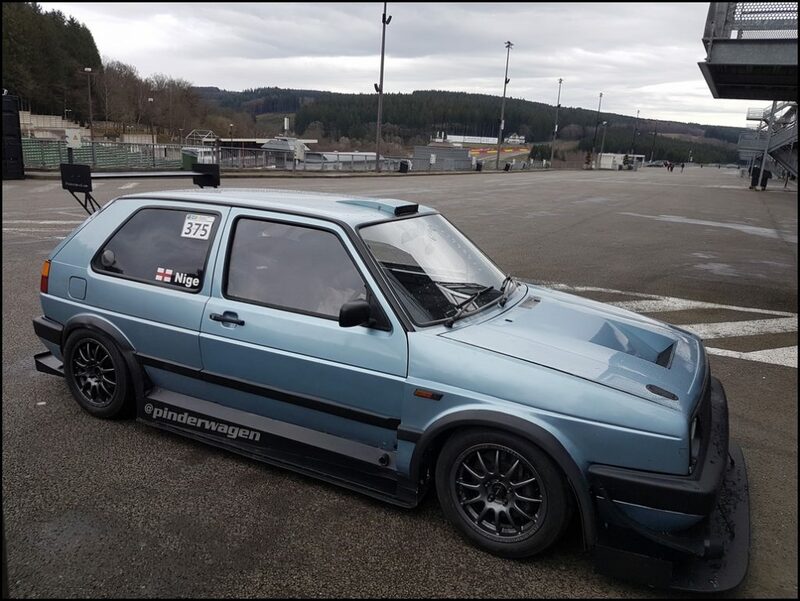 Took Matt out for a half hour session where he was able to start appreciating the circuit and the Golf and once the R1R`s were up to temperature they were surprisingly grippy. A couple more long sessions taking out Cat and Lou before lunch and then the rain started to slow. By the end of lunch, there was a visible dry part of the circuit and the sun was out so I made the decision to fit the slicks as more rain was forecast for later in the afternoon. 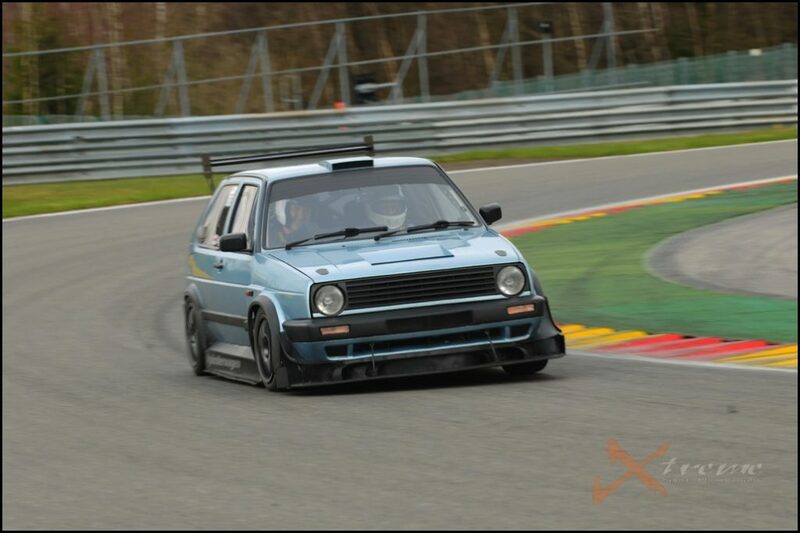 The fronts were very good condition Hankooks and the rears were the Toyos I bought at the beginning of last year. I’ve been doing trackdays long enough to know when tyres are worn out but I reckoned the Toyos had an afternoon left in them. I really should know better… As expected, the back end was quite loose for the first few laps, but even when warm they never gave the grip they used to which resulted in quite a few rear slides. I actually don’t mind this as I’ve spent a lot of time getting the car to handle so that when the rear does move it is very progressive and controllable. Whilst not the fastest way around the circuit, it is quite entertaining. We were ready to go out but the car wouldn`t start ! It took a couple of minutes to diagnose the isolator switch was making intermittent contact on the alternator grounding circuit. Bypassed that part of the switch and it was fine for the rest of the trip. New switch ordered and fitted within a couple of days of getting back home. Andy has seen this many times and instantly knew what it was. The second set of contacts are riveted onto the main switch and over time the switch loosens slightly meaning the main isolator works but not the secondary one. Matt thoroughly enjoyed this session and had a huge grin on his face the entire time. We had previously spoken about me talking whilst driving on track and Matt had asked if there was an opportunity he would appreciate me talking him through a lap to explain what I’m thinking whilst driving. If you watch the video below you`ll hear me talking much more than I usually do for that reason. There was quite a lot of traffic as I think everyone else had the same idea of getting onto the circuit and making the most of the dry weather window. Mike was there in his GT86 and I tagged onto the back of him for a couple of laps to get some chase footage for him. 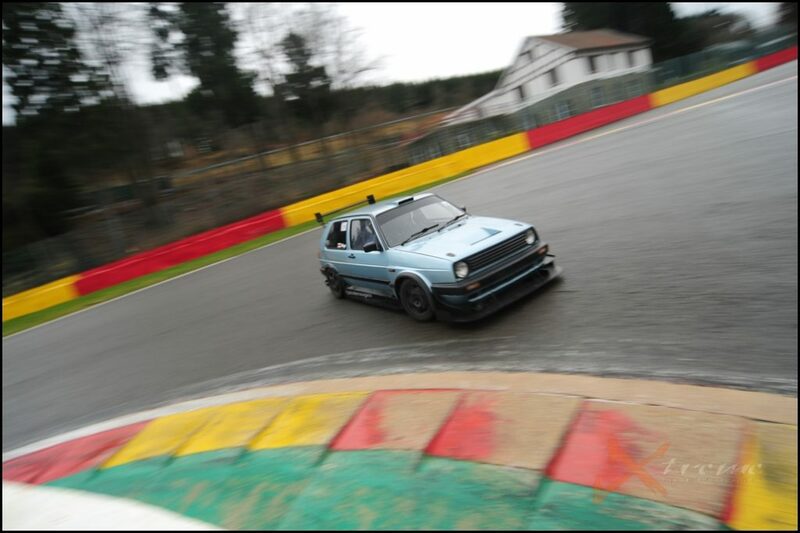 Returning back to the pits, I swapped the rear Toyos for some Hankook slicks which were in much better condition. Cat came out with me for a session whilst I warmed up the rears, and after the usual disconcerting sound of rubber pickup being thrown off the tyre and into the underside of the wheel arch had disappeared, I was able to start leaning on the tyres. Had a great session with Jamie in his Cayman. Blimey, they are good cars aren`t they ? 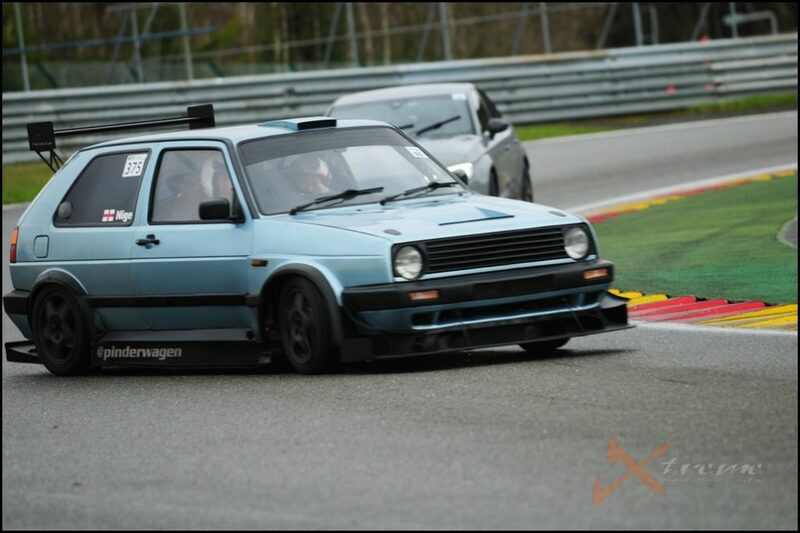 He`d driven to Spa, done 2 trackays at a similar pace to the Golf and was driving back home again. As a car straight from a manufacturer than can be used as a daily and on track they are most impressive. By now I was able to concentrate on improving my lines and not even think about how the Golf is performing. Everything was working as it should. 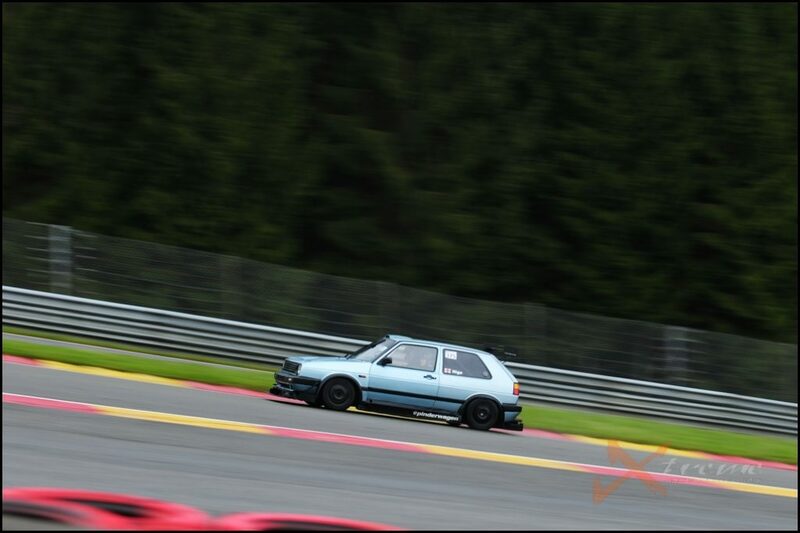 I find Spa one of those circuits that I can drive the wrong line or turn in a fraction too early and still go quite quickly but when you actually get a corner right the car feels superb. The day seemed particularly quiet on track at times and I expected to see a queue in the pits after refueling, however I was able to drive straight back out without any queuing whatsoever. Andy was free and I asked if he wanted to come out. After the usual tweaking of the odd line, I asked him if he fancied driving a few laps. He hasn’t driven the Golf before, but he is one of the few drivers I feel comfortable enough to let loose behind the wheel. His feedback from the passenger seat is always detailed and insightful and I was pretty sure that having driven the car, he would understand some of the issues I occasionally face. When Matt drives the Golf, he always makes several comments about things he believes need improving. From simple geometry tweak to brake pedal sensitivity. I was interested to see if Andy had similar feedback. 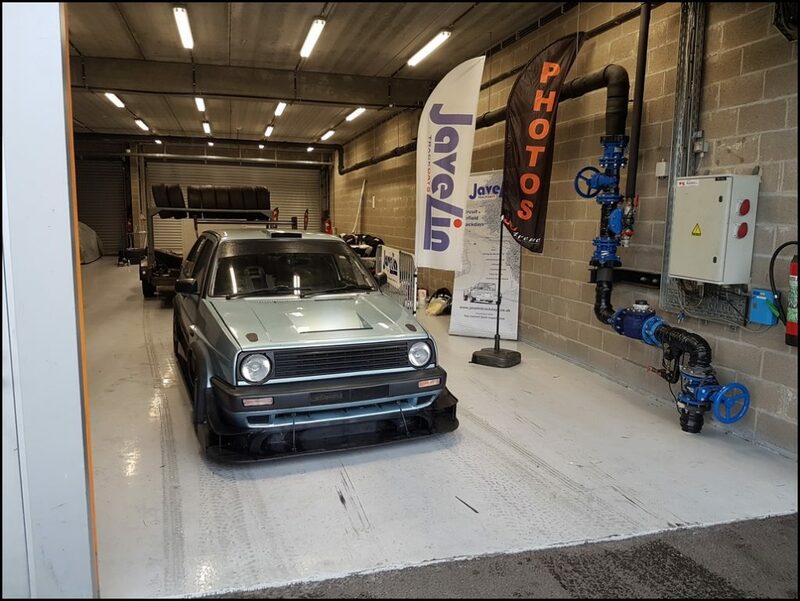 As we were leaving the pits, I started highlighting a couple of the known issues which were incredibly sensitive brake pedal, power steering assistance reduced in fast high G corners and slight vagueness around the straighter head steering position. I also warned him that if the rear did move, it was extremely communicative and not to over correct. The first time he hit the brake pedal, he locked up the front wheels . He spent the rest of the session having to concentrate on his throttle inputs and braking. His biggest issue was the brake pedal feel. I’ve recently installed some ex BTCC Raybestos front pads and even thought they offer excellent retardation, they are a fair bit grabbier on initial application. This isn’t helped by the high level of vacuum assist I run from the pump. At one point I had to tell him to ease off the brakes as he`d locked up the front left and I could feel it through the floor and it was starting to flat spot the tyre! 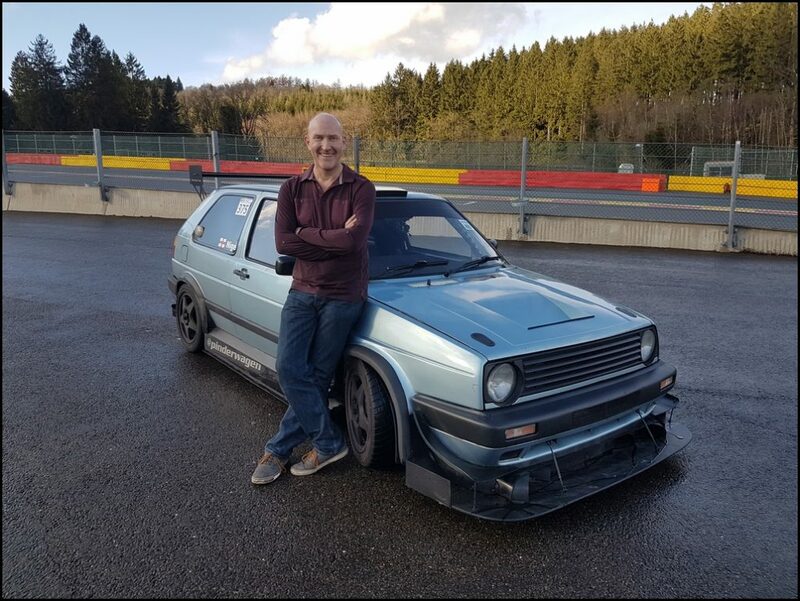 Andy summed up his experience by saying he didn’t think most people would realise just how tricky it was to drive the Golf quickly, even though it was such a good handling car. 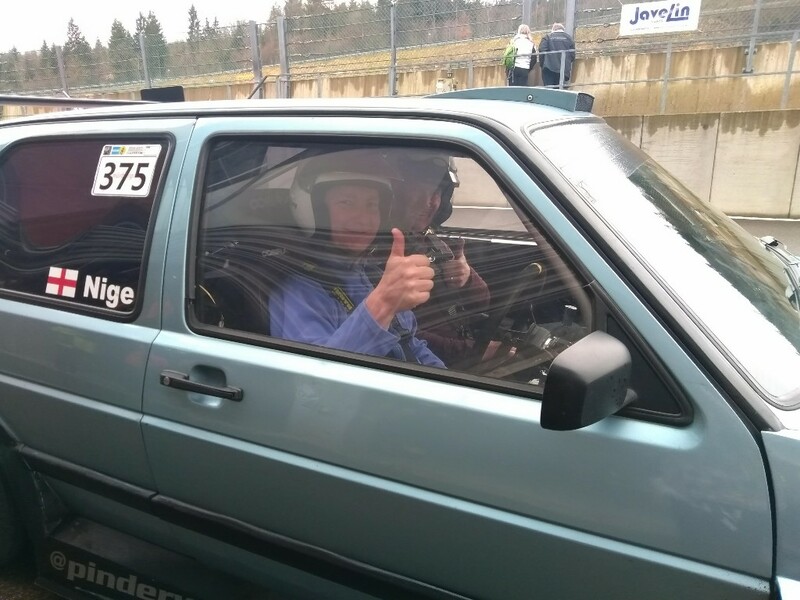 He has driven loads of cars over the years when instructing and is pretty confident that he can sit in a car and be up to a decent pace very quickly. The Golf proved more of a challenge, not because it is so good, but because I have learned to drive around a lot of little issues that I really should address. 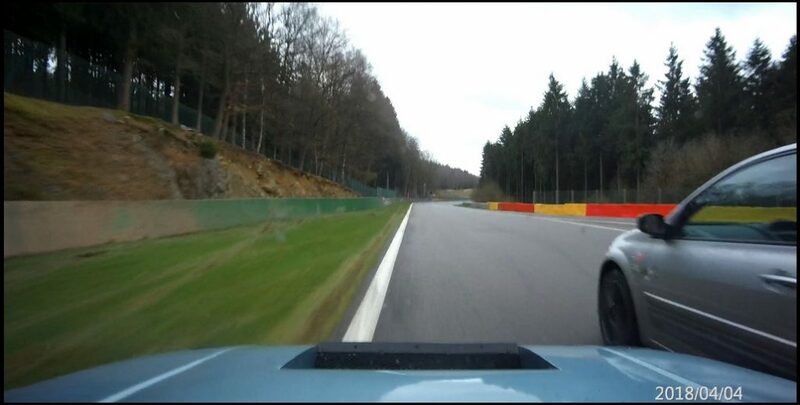 When I looked back at the driver cam and saw this huge grin on his face for almost the entire session, I knew he`d enjoyed himself. I think that is a good thing and the feedback was exactly what I was wanting. I drive the Golf so much I get used to the little idiosyncrasies and getting comments someone else is always useful. Since Spa I`ve reduced the Vac assistance and the brake pedal is now much less sensitive whilst requiring more pedal pressure. The steering column universal joint has been replaced as that had a little bit of play and was causing the vagueness, a power steering cooler is on order to fit which will stop the fluid overheating and causing the steering weighting up in some corners. 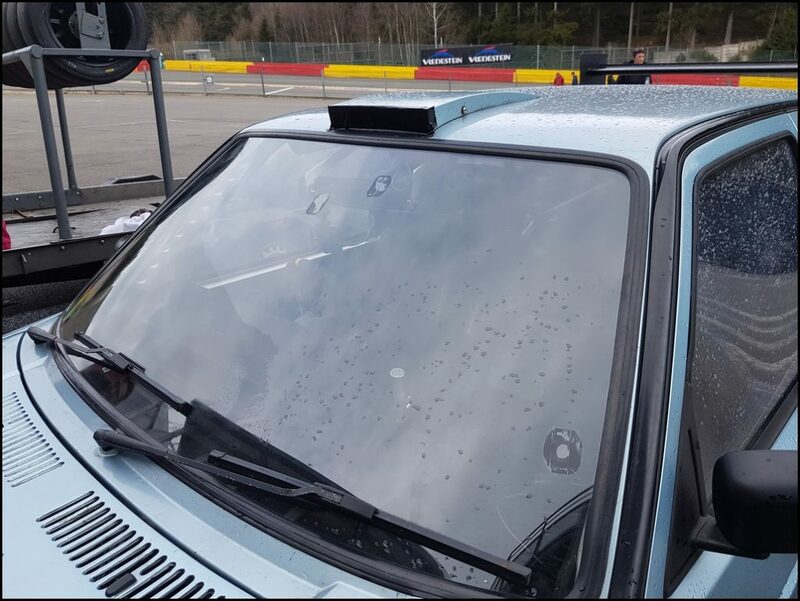 He`s also an accomplished instructor at the Nurburgring and Spa having spent years doing 1,000`s of laps driving and instructing on both tracks. He knows his way around both circuits and he`s rather handy behind the wheel. 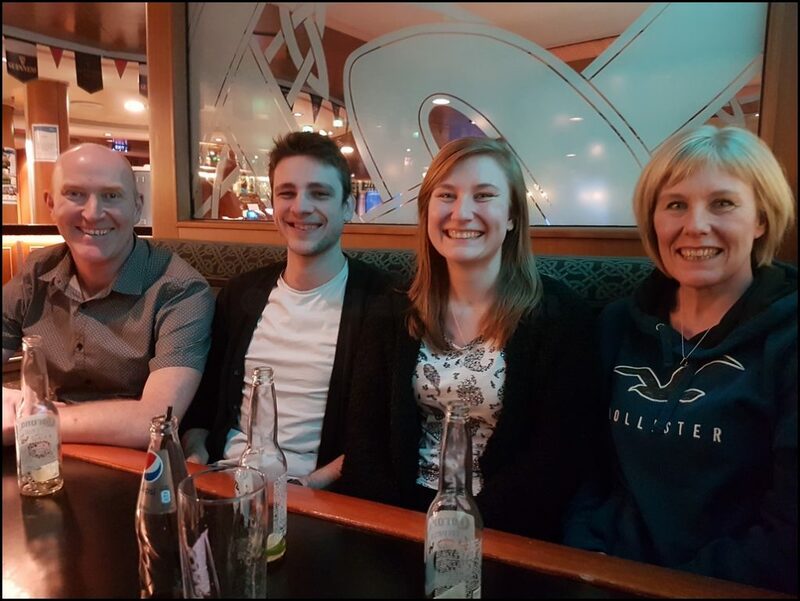 I`ve known Andy for over 10 years and he is a good friend. He has spent a lot of the development journey in the Golf sat next to me and has seen it through every stage of engine, chassis and aero development. I`m not speaking out of turn when I say Andy is a `thinker`. You won`t find him jumping to conclusions and blurting out the first thing that pops into his mind. He will pause, have a little think, take a breath, have another little think and then share with your his thoughts whilst still wondering if what he is saying could be improved or reworded. When he says something you know it has been mentally dissected and rethought several times before he opens his mouth. Why am I explaining so much about Andy ? Well this landed in my inbox this morning. I had asked him for a few words about his experience in the Golf at Spa but I know he is busy and I`m not one to pester. If he hasn`t written anything then there is a reason for it. That was what I assumed anyway… Turns out he had put his thoughts on paper and me posting this was the nudge he needed to get them typed up and sent to me today. Dammit. I was supposed to write this up ages ago… and currently I am supposed to be elsewhere… I am resigned to my administrative capabilities always being on a rob Peter to pay Paul basis, but since Spa is to be revisited physically, why not revisit mentally in a Golf. Nige wrote up a few comments and those are posted hereabouts. Not as detailed as they ought to be after the kind offer of a rattle around Spa. I think I did about 6 or 7 laps, but honestly I find lap counting in cars really difficult, was that lap 3 or… erm. Anyway, best rectify the late feedback. This is written partly as feedback on the car, but also maybe as a self reminder on learning and sampling other vehicles. Even when you have significant seat time in the vehicle. So right at the end of my driving time Nige and I chatting whilst stationary I noticed the milage. 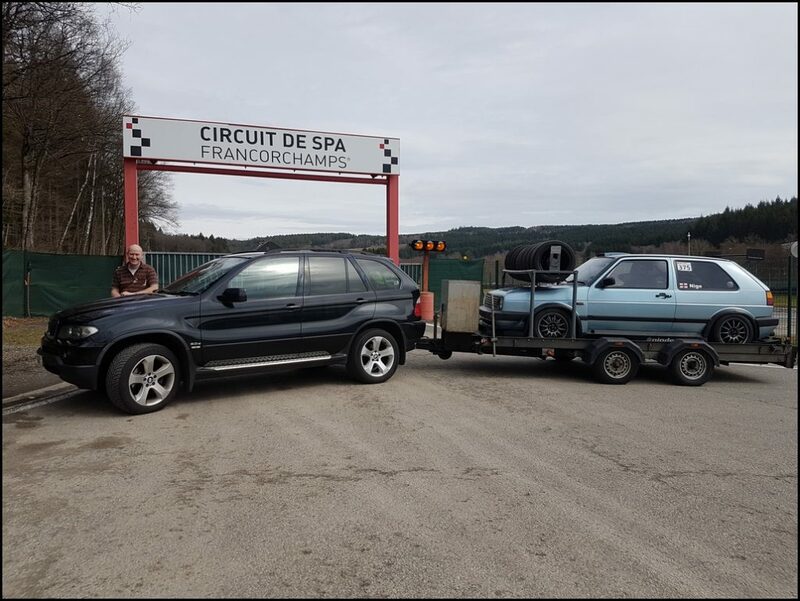 You may not realise the Pinderwagen has done 45,000 miles on track. Granted there have been several phases of development over time, but that is a very long time spent on track. I have been in the passenger seat quite a lot over the last 10 ish years. And we regularly bat ideas around. So back to earlier in the day, and us musing the idea of Blanchimont being taken flat out. First up is this realistic? Yes, its very close to that and the available ‘spare’ is sufficient this is only a mental exercise, nothing mechanical felt like it needed changed. I’ll come back to that. Nige is a considerate driver on track, no one gets pushed. But Nige is almost too polite. However our stint was late in the day and the track was pretty quiet. The Pinderwagen has evolved into a car developed for high speed, and the aero just gets better the faster you go. 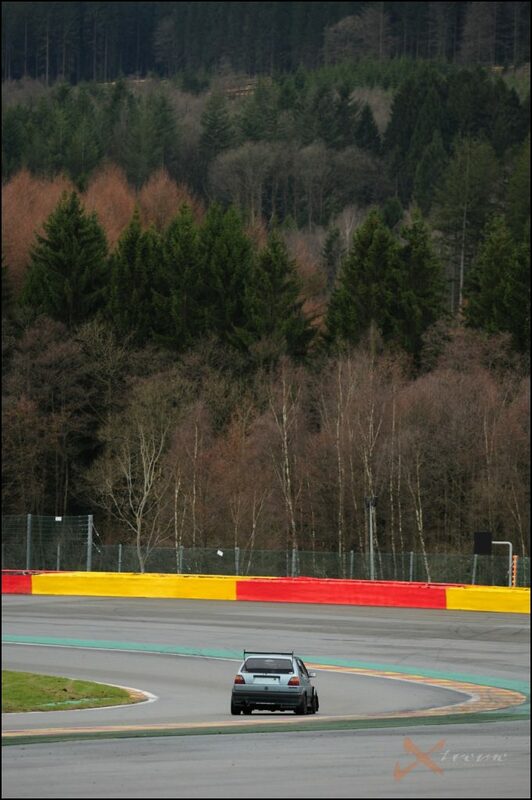 All aligned for Spa just right. And we must have got the driver fired up as we are super close to flat out, whilst choosing not to be, and consistent enough and speedy enough that the steering boot might have got sufficiently hot to catch fire… that’s how fast and long we spent at high speed and load. Remember this is mid April, its not 35 degrees. But in that time we sometimes nibbled a few inside curves, but only on the fastest of corners. This never normally happens, that 2 inch of inaccuracy under pressure [Except its not driver under pressure] is indicative of Nige going that step harder than normal. Previously I had suggested the back axle of the Golf be loosened up a little to get the back to pivot around a bit easier and increase agility. The improvements to the diff now make the front nice to point and grip (noting that Megane‘s with 300plus can be a right handful, full attention type of car. The Golf is totally friendly at high and full throttle openings). And the ridiculously addictive boost button is just right – tight stuff will not accept the extra torque the increased boost of 0.4 bar generates. And releasing the boost a little before gear changes increases mechanical longevity right? Post event it was revealed the inlet was being a little restrictive, but honestly I didn’t feel this. The refreshed diff though is great. Not too aggressive, does exactly what it says on the tin. So those comments on steering and pressure, its going somewhere right? Going back to my notes, yeah, I did make some, they say the Golf feels like something much more expensive. I’ve written ‘poise’. Y’know how some stuff your waiting for the front to grip, others are limited by feedback from the back? Some you’re limited by suspension travel or bodyroll. Nige’s aero is absolutely balanced in its assistance front to back. Both ends are definitely the same car. It doesn’t steer with the front wheels like something Japanesey, and it’s not French and tail happy. Its little Radical, or 430 Challenge levels of development and feel. But with the difference, to me, that it feels like it’s been skewered vertically through the handbrake lever, as the whole thing seems to rotate around this imaginary point. There is a ‘but’ though. The cars mentioned above are not, and never were shopping-boxes. 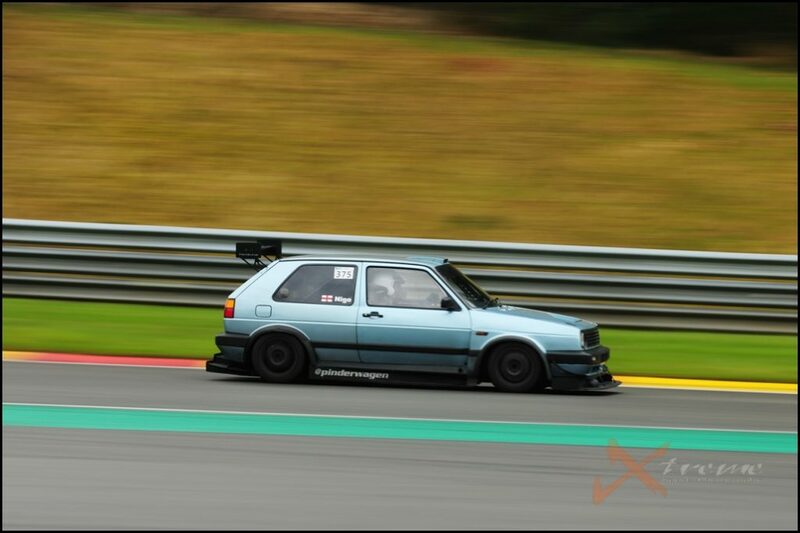 This Golf was a normal car. And the efforts to force it this far outside its design envelope significant. Especially when you consider the solutions are self supplied and applied. Not the result of just phoning R and D.
I noticed the column isn’t as rigid as some insist on. I don’t notice that once moving as I’m listening for the tyres. So a bit of flex isn’t a distraction. So after a few corners acclimatisation, speeds have lifted up and loads through some bits are reasonably high. Enough to notice some odd inputs into the steering wheel – my theory is this; the power steering is working well up to a point. 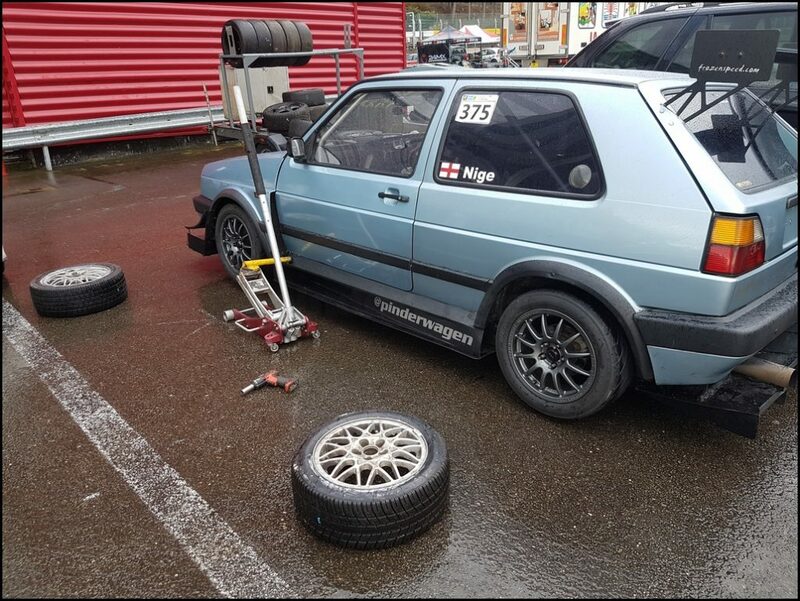 And Nige is so used to his car that now the steering pump needs to get re-visited (I think it’s Saxo, and unless I missed it, there isn’t a flat floor, 330bhp version of a Saxo). Steering effort at turn is for fast and slow stuff attracts no comment, it just went where you pointed it… up to a point. Above a certain load though, you turn in as normal, then the steering runs out of strength just you need a bit more. So your muscles go from needing to provide negligible control inputs, to significant powerful, yet dexterous inputs, then a moment later the steering assistance returns, and you need to lighten your actions and return to somewhere near the power level of the first phase. I suspect this means the electro-hydraulic assistance is either getting too hot, and momentarily shutting off. Or, perhaps more likely, the down force and decidedly non-Golf-like levels of grip are fighting back against the available power so much there is momentarily no assistance. The muscle-blending is the tricky bit. Remember your travelling at high load to get this to happen. Higher than the ‘normal’ high loads Pinderwagen is travelling at. I only did this few times, don’t poke the reaper and all that. But Nige has adapted to the point of not noticing it, but it shows up when going that little bit harder – almost flat for Blanchimont, and tiny inside kerb nibbles happen. 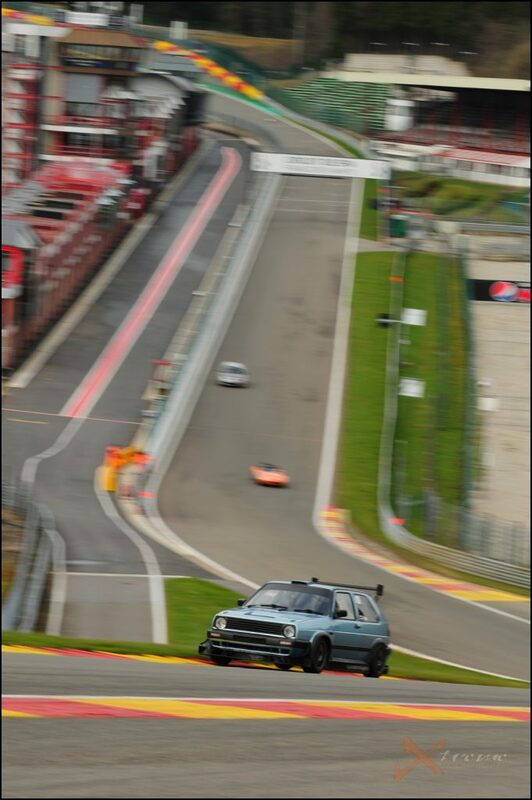 To leap back to the end; I thanked Nige for his kind offer and driving the Golf, but I commented I was pleased I had driven at Spa, not the Ring. And we both agreed this was prudent. So when I say it’s got character, some bits are very forgiving and communicative. Other bits are unusual. Not bad. Just behaviour you don’t normally get to experience. So to have clear knowledge of the track, all other users are easy to predict, there’s no stress, it’s just learning a car that has elements on the extremis of my experience scatter graph. 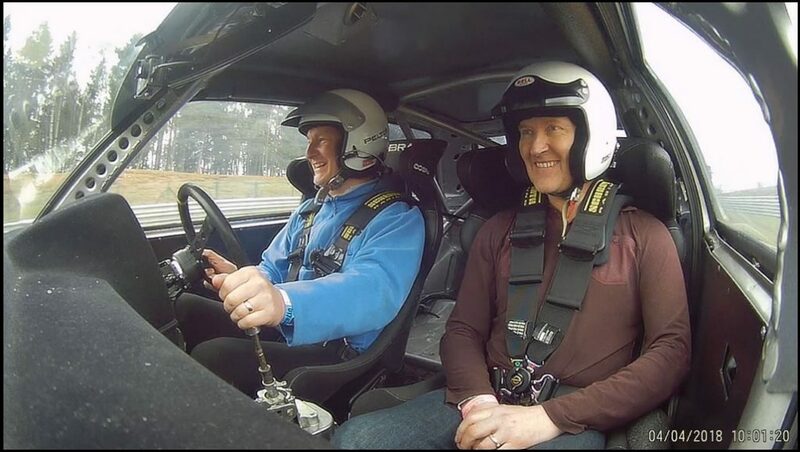 Andy J and I mentioned pedal position and the vac assistance as has Matt several times and Gurds repeated this after MK1 to 2 swops at Cadwell last year. Clutch was slow to return, too slow to enact double de-clutch and the pedal wouldn’t be home by the time you need the second press. That not to say I did DDC, a personal ‘put some thinking time back in the bank’ idea is to change gear rather slowly in unfamiliar stuff. Gear throws are all different, over-revs always cause grumpiness, and it’s never bad to take your time. Anway, new cable all sorted. Interesting how familiarity causes us all to miss stuff. The brakes. Not my finest hour y’honour. Golf’s don’t have ABS. I know this. I wondered how much more braking the Golf had. And a shudder under normal loads that disappeared under higher loads left me wondering if something could be learned at the quieter zone above the shudder (small warp in disks). Answer nope. Pedal travel is (was) most short, unusually so. And with high vacuum assistance and the larger diameter disks coupled to powerful 6 pots and aggressive pads in the damp conditions… I locked the rears coming into Rivage 1, recognised it felt different, but ran out of space and a small excursion took place. This might have happened again into the Z chicane ( both areas with known, sizeable spare space, something that was not at all left to luck), unless there isn’t video evidence, in which case it didn’t. Ahem. To give you an idea the pedal from free play to normal hard track appropriate braking is about 4/5/6mm. 8mm is all four wheels long since locked I reckon. Hands up; I didn’t adapt as well or as promptly as I thought I would to this. An interesting reminder about learning in steps, and trying stuff with enough plan B to not embarrass oneself too much. Thank you for the seat time Nige. A great memory. And an eye opener in how well you pilot the car. Whilst I was out with Andy, Jon asked Cat if she fancied a lap in the Boxter. Even though he had taken her out for a few passenger laps earlier in the day, she was still happy to jump in the passenger seat. 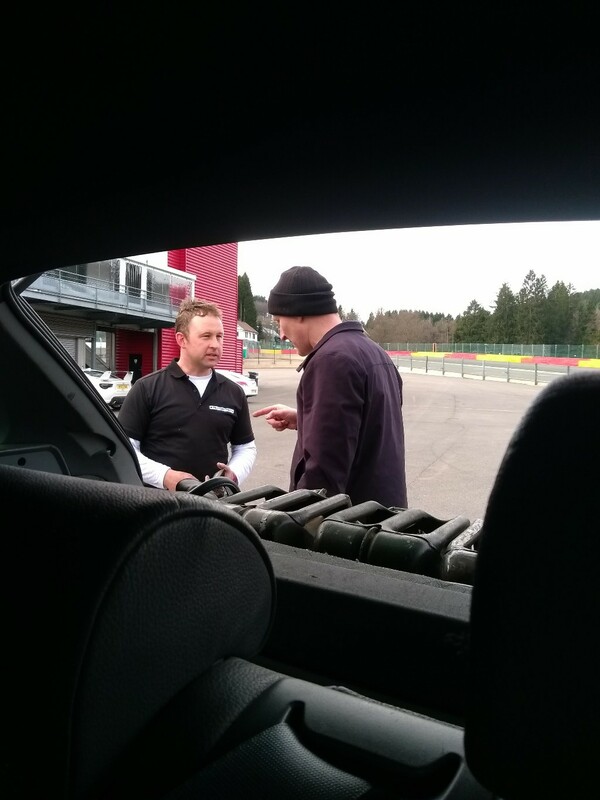 Jon exclaimed, “I actually meant for you to drive and take Matt for a lap.” . Cat explained she wasn’t comfortable just jumping in and driving straight away and she would prefer that Jon accompany her for at least one lap so he could highlight any peculiarities when driving the Prosche and also to make sure he was happy with her driving ability. When they returned to the pits, Jon climbed out, told Matt to get in, and said, “Have fun!”. Cat went out and did an out lap, a flying lap, and then back into the pits. 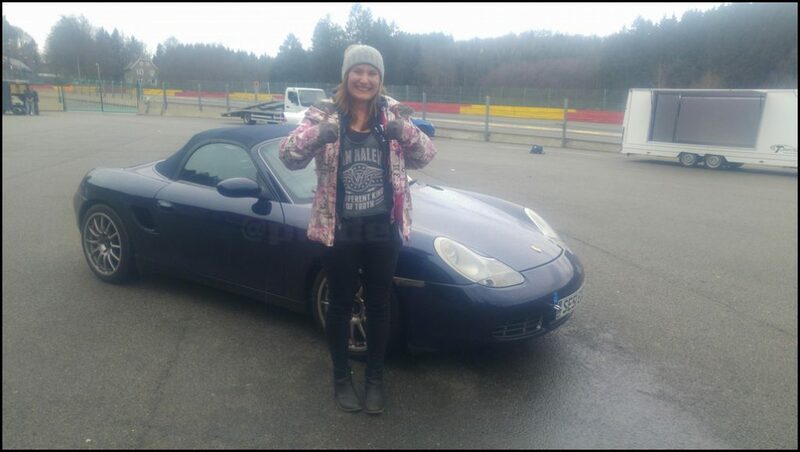 Whilst 3 laps may not seem that much to some people, she was absolutely thrilled that not only had Jon let her drive, but that he had trusted her with his car even though he was booked on for the second day as well! It had started drizzling by now and it was time to refit the R1R’s. 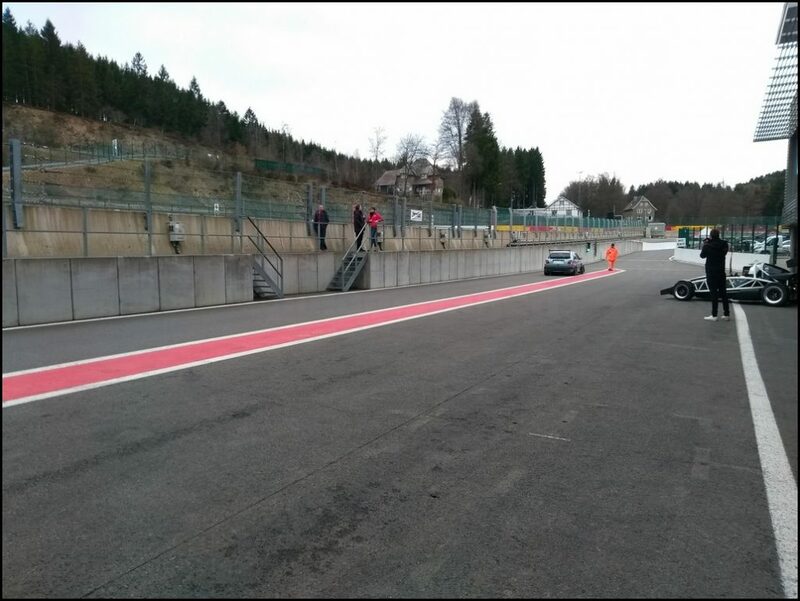 Even though the circuit had gone from being very grippy to slippery, all the drivers used sufficient caution that there were no incidents causing red flags that day. When driving I tend to setup the Golf so it is pretty benign and the rear doesn`t move around much. I run a standard front ARB and non on the rear. It all stems back to when I crashed my first Golf and that had a much more mobile back end than this one. Since then I`d like to think I have improved my driving which is why I tweaked the rear camber and toe to reduce the rear numbness a little. 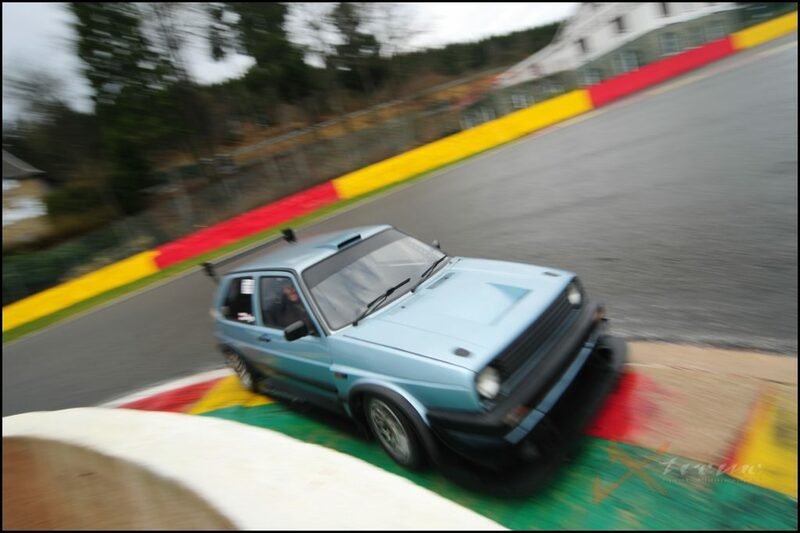 The circuit was slippery and I was driving a modern F1 circuit with huge run offs in places. Whilst I certainly didn`t go out planning to drive like an idiot, I realised this was probably the best opportunity I would ever get to let the car move around a little and see what happened. 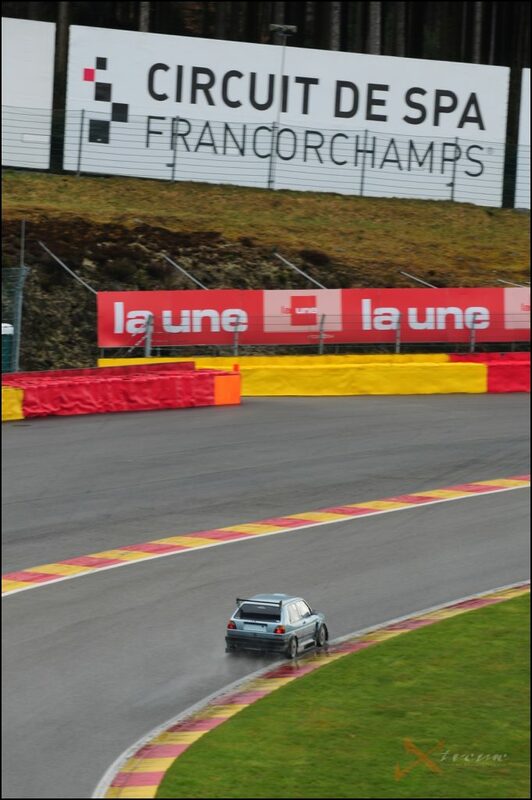 I only did this when there were no cars around, but I made use of the conditions and started to lift off through corners like Pouhon and Blanchimont. Initially just a little but and nice and gradually, but enough so that I could start to feel the rear moving and a bit of throttle soon brought it back into line. As the afternoon progressed I was able to lift off for longer and really started to understand what was happening and how the car reacted. The restaurant was somewhere Nick has been before and whilst the food and the company was excellent, the service was pretty poor if I`m quite honest. We were waiting a long time for drinks and the meal. Even so, we left at around 23:00 after realising it was so late. I find it a good sign when I look at my watch and it`s much later than expected, it almost always means you have had a great time. I`ve known Jordan for several years now but we just haven`t been on circuit together before. I spoke to him yesterday afternoon and we both said we needed to make a conscious decision to go out on track together and take it in turns leading / following each other. I agreed to leave the engine on low boost. Even though his engine is putting out plenty power, we knew the Golf on high boost would pull away. He was on full wets and I was R1R`s. I really enjoy these sort of sessions where each car has different strengths and weaknesses, for example he had more traction but I had more high speed stability. We were lapping for 25 minutes and had swapped places a few times already when I pulled over and let him past on the start/finish straight. After a brief Red flag whilst he was recovered I asked Andy Jebson if he fancied a drive of the Golf. I`d already explained the issues Andy C had experienced yesterday but he was still happy to drive a few laps. Getting used to the brakes meant we missed the usual turn in point and the later entry into LaSource had the back moving around a little. 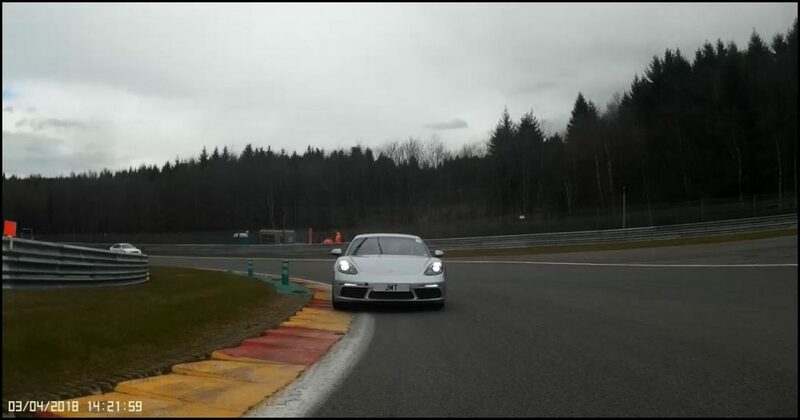 The entry to Pouhon was particularly slipperly. Not really sure why certain corners felt worse than others but it took longer to dry than most of the others. The large runoff can give you a false sense of security but the speeds you can take through the corner means that runoff would soon disappear if you went off. The circuit would start to dry, so you could lean on the tyres a bit, then just as you were getting quicker it would start drizzling again. If nothing else it kept you on your toes ! Seeing as Jordan was unable to drive I took him out for a session. It was going well and even though the circuit was still slippery he was able to see where the Aero made a difference and how benign the handling was. This was particularly apparent when I entered Pouhon a little too quickly. Usually I would just floor the throttle which would bring everything back into line straight away, but after the practise yesterday I felt very comfortable with the movement and balanced the car on the throttle all the way through the corner before straightening it up and carrying on. 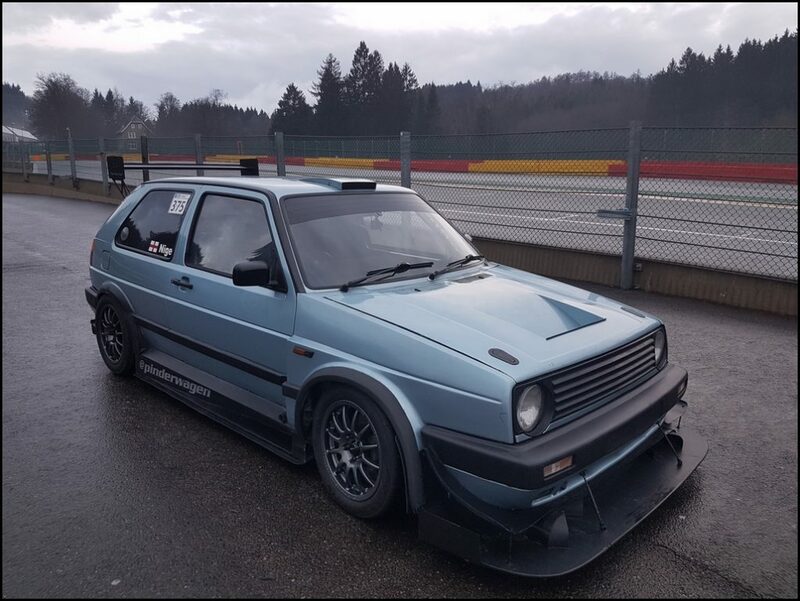 I`m not a drifter and wouldn`t be driving like this on the Ring, but as I explained earlier, I used the slippery conditions to practise and understand how the Golf reacted to a low grip situations. The biggest benefit I found was the ability to keep things slow and controlled. Even when I`m driving quickly I still have time to take in what is happening and chat to my passenger, but I always go quiet when something unexpected happens as I need that extra concentration. I only have 1/3 of right hand lock on here going through the left hander but as anyone who has had a moment will know, it always feels much worse when you are actually behind the wheel. I was able to spend the rest of the afternoon filling up with fuel and taking people out for laps. 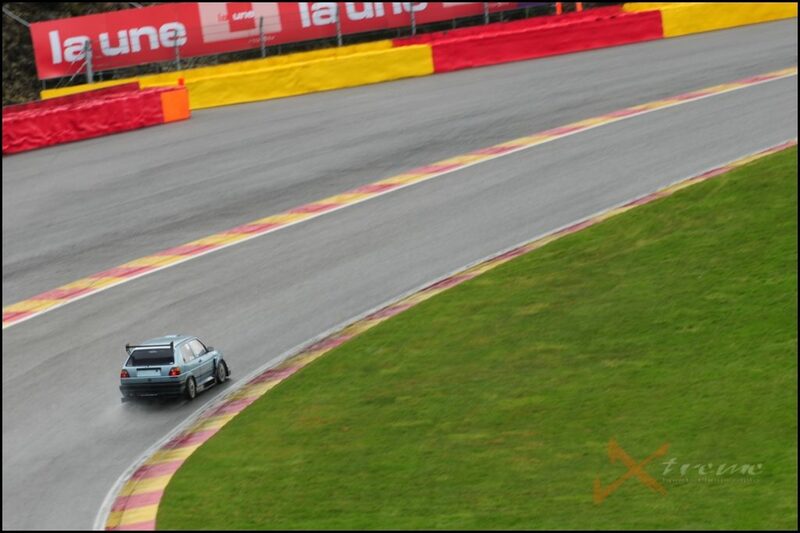 Whilst that doesn`t always happen, I was absolutely delighted to be able to keep driving with no car issues. The tyre wear was so low I didn`t even need to swap them around to even out the wear. Usually on a 2 day event I would swap them front to rear at the end of the 1st day to wear them equally but I just didn`t need to. Would I have preferred 2 days of bright sunshine and the ability to run Slicks for the whole time ? At the time I would have immediately said yes but looking back, I learned far more in the damp conditions and probably had more fun with the car moving around so much. When the driving finished we loaded everything up onto the trailer and drove back to the Guest House. I fancied a beer so we ate there instead of going out, and spent the evening discussing what an awesome couple of days we`d just had. The acceleration was blisteringly quick, but what really overwhelmed me was how staggering the brakes are, and how much speed the Golf could carry through corners. For my first few passenger laps, there were genuine moments where I thought “we’re going to go off, he’s going far too quickly into this corner” but thankfully it didn’t take me long to realise just how good your car really is! If you have read one of these reports before or know me, you will know that is exactly the sort of response that makes it all worthwhile to me. 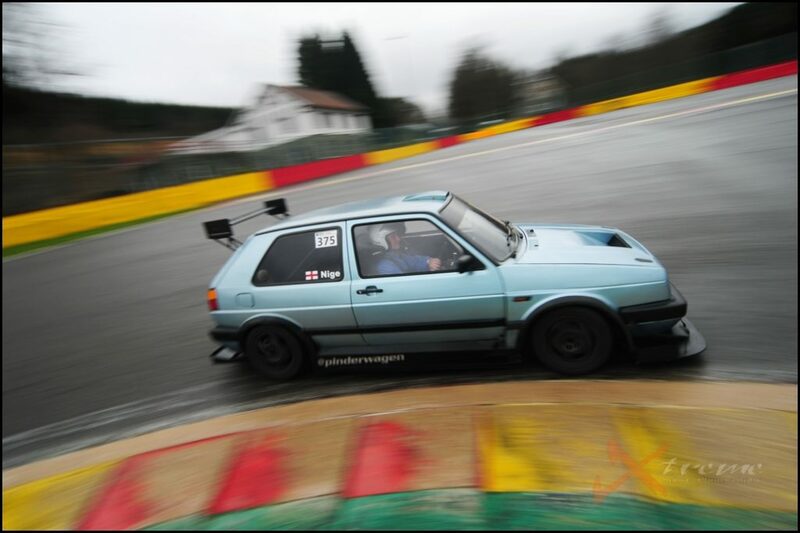 It`s why you hardly ever see me without a passenger in the Golf. Sharing the experience and seeing the expressions on the passengers faces always makes me grateful I am able to share my passion with others. On the drive back to Rotterdam the next day we stopped in Antwerp for a walk round. 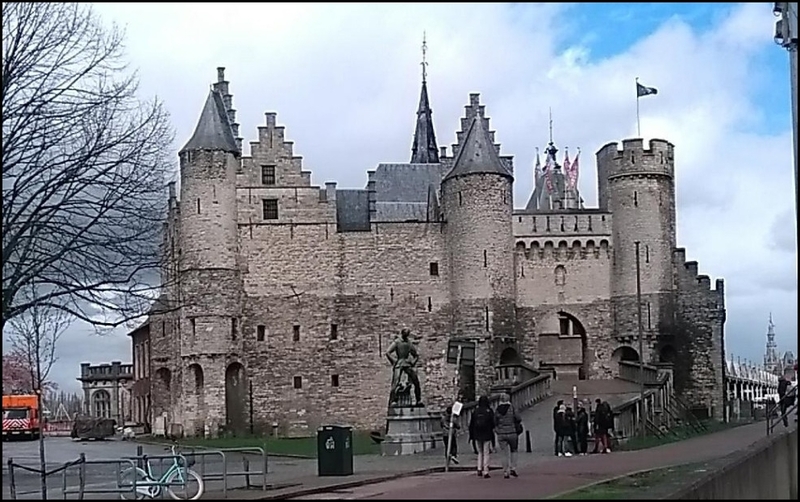 I`ve driven past many times but we had time to spare and decided to have a walk around. I was struggling to find anywhere to park the car and trailer and then saw this large carpark so pulled in. 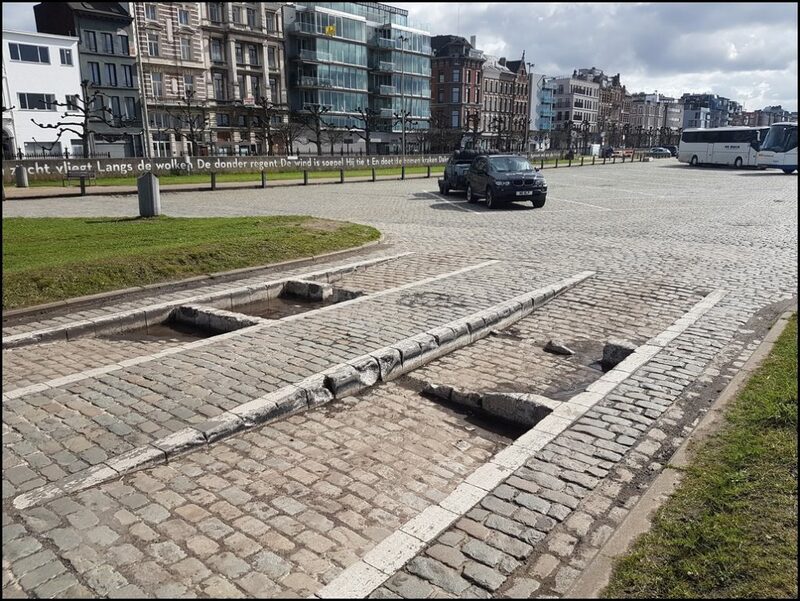 The signs said coaches only so I asked a local policeman if I could park there. I just drove in, why ? We spent an enjoyable few hours walking around, having some lunch and exploring the city. It is often a case of travelling straight to the circuit and back again when doing these European trackdays, so being able to spend a little bit of time doing something non car related was a nice end to the trip. 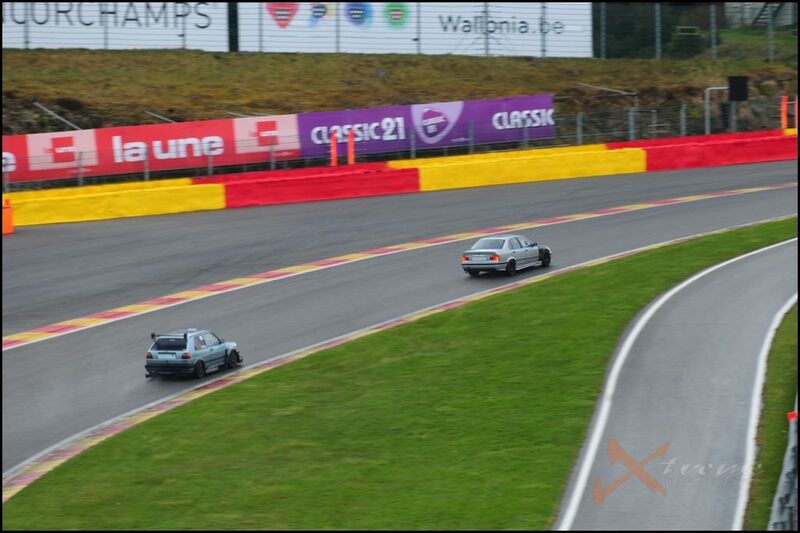 Another Spa trip over and once again the circuit doesn`t disappoint. 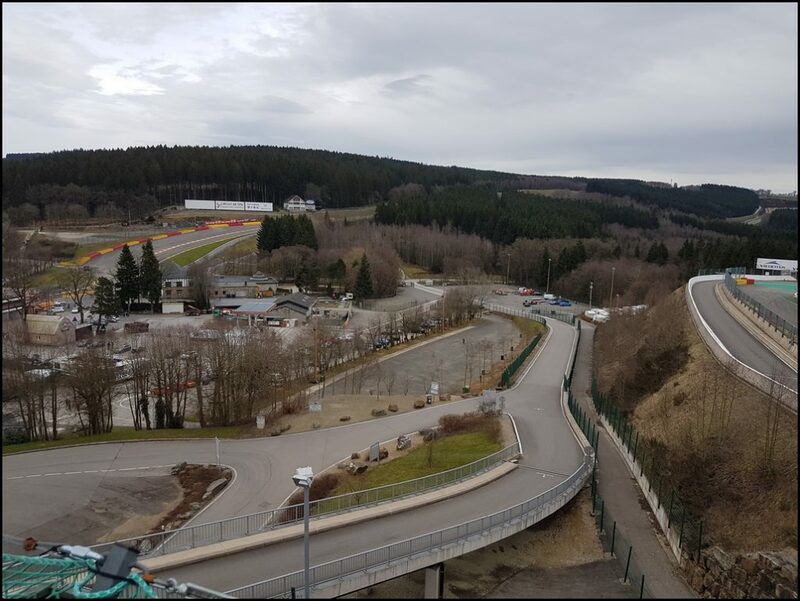 I am genuinely torn between Spa and the Nürburgring when asked to choose my favourite circuit. They are so different that it is really hard to compare. I suppose life can`t be that bad when I am in the position where I find it difficult to try and choose between 2 of the greatest circuits in the world ! Letting other people drive the Golf is something I don`t often do. I let my son drive, but rarely anyone else. Thats` for a couple of reasons, but the main one is that I want to drive myself ! I get such a buzz out of driving on a circuit that I want to get as much seat time as I can. Letting someone else behind the wheel cuts down on my driving, but I also realise getting the thoughts from experienced drivers is very useful and in the long run their observations help me to continue to improve the car. 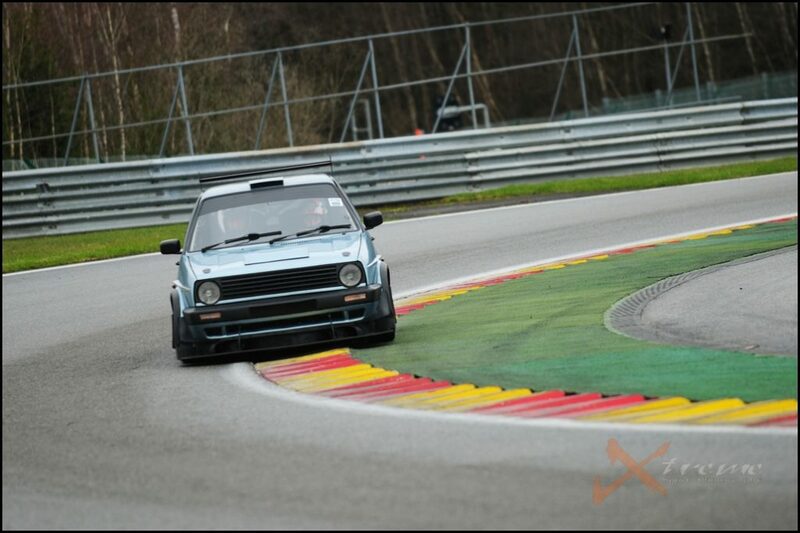 Yet again the Pinderwagen lapped and lapped without complaint on a very demanding trackday. Whilst I don`t expect mechanical issues I try not get be too surprised when they do pop up. Neither a puncture or dodgy battery isolator switch are insurmountable problems and I was able to fix both of them and be back out lapping very quickly. 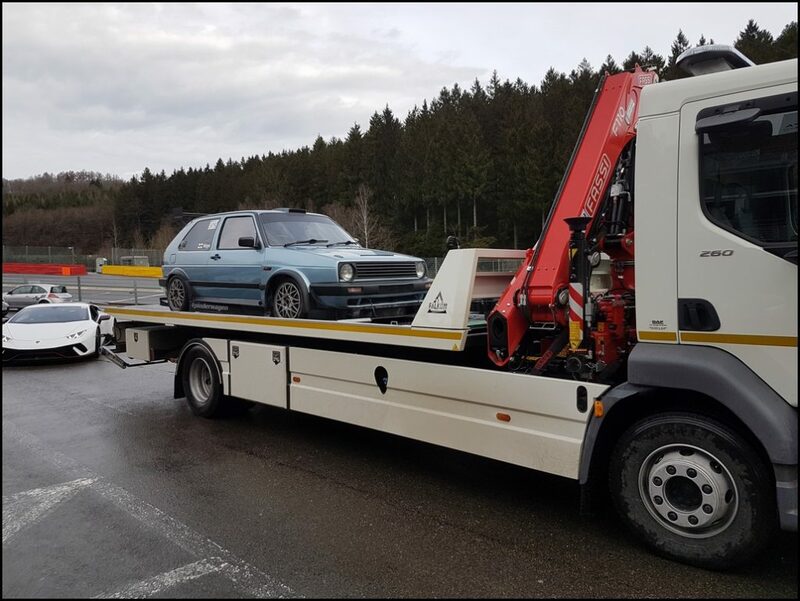 Driving back home with the car on the trailer knowing I didn`t need to do anything before the next outing is extremely satisfying. That isn`t to say I won`t give it a once over, but I am delighted with the reliability I`m experiencing at the moment. 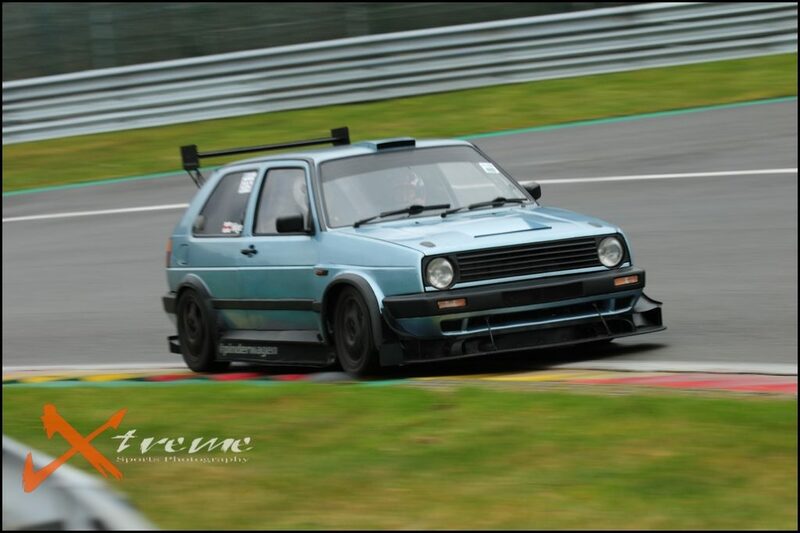 My next trackday is at the Nürburgring in 3 weeks. 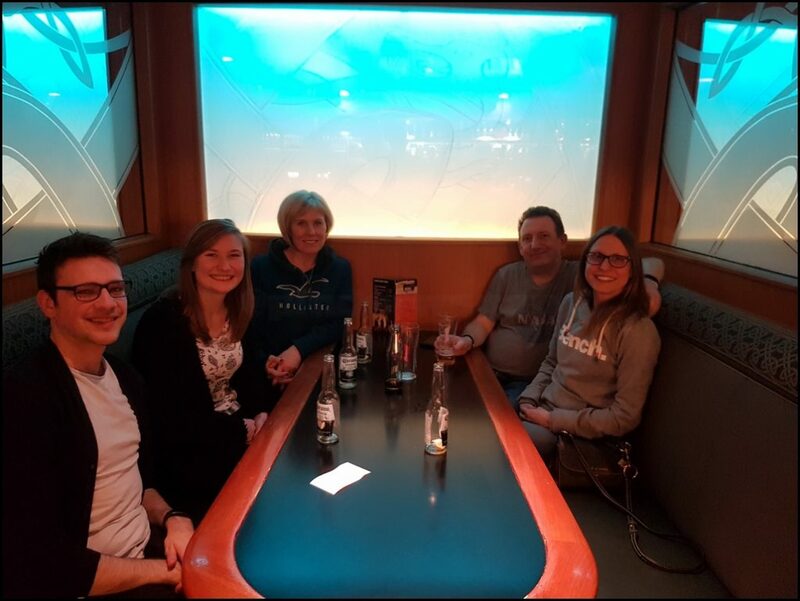 Whilst I certainly don`t want to tempt fate, I`m going to be driving over to Germany in a good mood and full of confidence after experiencing such a trouble free trip to Spa.